To reduce inflammation various herbal remedies, including white willow (Salix alba), yarrow (Achillea millefolium), and lobelia (Lobelia inflata), may be helpful. Acupuncture, performed by a trained professional, has helped some patients manage their pain. Homeopathic practitioners may prescribe such remedies as Bryonia and Rhus toxicodendron for pain relief. Ankylosing — When bones of a joint are fused, stiff, or rigid. HLA-B27 — An antigen or protein marker on cells that may indicate ankylosing spondylitis. Immune suppressing — Anything that reduces the activity of the immune system. Inflammation — A reaction of tissues to disease or injury, often associated with pain and swelling. Spondylitis — An inflammation of the spine. Matsen III, Frederick, ed. "Ankylosing Spondylitis." University of Washington Orthopaedics and Sports Medicine. http://www.orthop.washington.edu/arthritis/types/ankylosingspondylitis. A chronic form of arthritis that chiefly affects the spine and can lead to fusion of the vertebrae. a chronic inflammatory disease associated with human leukocyte antigen B27, first affecting the spine and adjacent structures and commonly progressing to eventual fusion (ankylosis) of the involved joints. In extreme cases a forward flexion of the spine, called a "poker spine" or "bamboo spine," develops. The disease primarily affects males under 30 years of age and generally follows a course of 20 years. There is a strong hereditary tendency. In addition to the spine, the joints of the hip, shoulder, neck, ribs, and jaw are often involved. 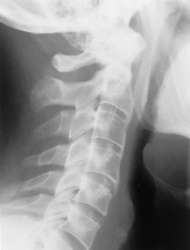 When the costovertebral joints are involved, the patient may have difficulty in expanding the rib cage while breathing. Ankylosing spondylitis is a systemic disease, often affecting the eyes and heart. Many patients also have inflammatory bowel disease. The aim of treatment is to reduce pain and inflammation in the involved joints, usually with nonsteroidal antiinflammatory drugs and tumor necrosis factor drugs. Physical therapy helps keep the spine as erect as possible to prevent flexion contractures. In advanced cases, surgery may be performed to straighten a badly deformed spine. Also called Marie-Strümpell arthritis, Marie-Strümpell disease. See also ankylosis, rheumatoid arthritis. Arthritis of the spine, resembling rheumatoid arthritis, which may progress to bony ankylosis with lipping of vertebral margins; the disease is more common in the male, often with the rheumatoid factor absent and the HLA antigen present. There is a striking association with the B27 tissue type and the strong familial aggregation suggests an important genetic factor. A chronic inflammatory disease of the spinal column leading to stiffening and fixity of the ligaments and bones, so that, eventually, almost all movement is lost. a type of arthritis known to be associated with the HLA antigen B27. Although this antigen occurs in only 8% of the British population, 90% of British patients with the condition have B27. However, the fact that not all affected people possess the antigen and, conversely, not all people with B27 have the condition, indicates that B27 cannot be the cause of ankylosing spondylitis. It may be that the antigen increases susceptibility to an environmental agent such as a virus. a progressive inflammatory condition affecting the spine and sacroiliac joints, occurring most commonly in young men. Characterized in its later stages by ossification of the spinal ligaments and ankylosis (fixation) of the sacroiliac joints. aka bamboo spine . Inflammation of both iris and ciliary body. The ciliary body is almost always involved with an inflammation of the iris. The clinical picture of iridocyclitis is practically the same as iritis. The condition is often associated with ankylosing spondylitis or sarcoidosis. See anisocoria; rheumatoid arthritis; heterochromia; Behçet's syndrome; uveitis. caused by or emanating from fixation of the joint. Preliminary evidence for cachexia in patients with well-established ankylosing spondylitis. Spondyloarthritis research consortium of Canada magnetic resonance imaging index for assessment of sacroiliac joint inflammation in ankylosing spondylitis. A study conducted in 1983 concluded that muscle changes do occur in ankylosing spondylitis and more specifically, muscle atrophy in the quadriceps was seen in eight out the twenty subjects. Longitudinal numbers-needed-to-treat (NNT) for achieving various levels of analgesic response and improvement with etoricoxib, naproxen, and placebo in ankylosing spondylitis. Serum oxidative-antioxidative status in patients with ankylosing spondylitis. Ankylosing spondylitis in North India: a clinical and immunogenetic study. Loss of hip movement is most marked in ankylosing spondylitis, where hip muscles have sometimes been inactive for a number of years. If the most efficient recovery means specific to ankylosing spondylitis are selected and applied, the improvement of respiratory parameters and patients' health status can be influenced. early collection of the safety and efficacy data on HUMIRA and necessary measures for its proper use, which were submitted to the MHLW in an interim report of the all-case surveillance in 127 patients with ankylosing spondylitis. Asim Khan then decided to specialize in this disease after graduation and has suffered from ankylosing spondylitis for the last fifty nine years. NEW YORK -- Patients with ankylosing spondylitis who used opiate analgesics were five times more likely to report depression than were those who did not, in a retrospective case-control study of 611 patients. Mark Isherwood AM signed a pledge at the Welsh Assembly to support people in Wales living with ankylosing spondylitis (AS), which affects joints in the spine and the pelvis and can cause fusion of the spine.